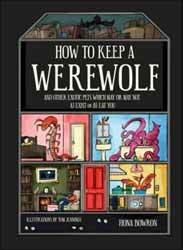 How to Keep a Werewolf and Other Exotic Pets Which May or May Not A) Exist or B) Try to Eat You (to offer its full title), by Fiona Bowron, is a light-hearted exploration of cryptids – mythological creatures – and how/whether they can be domesticized as pets. The colour illustrations are by Tom Jennings. The book is released in hardback format by Portico, an imprint of Pavilion Books, London. Let me begin by describing the appearance of the book. In short it’s quite beautiful. It’s just slightly smaller than A5 size. The pages are thick and of good quality, white print on black, with the majority of the pages incorporating inventive colour drawings, including an Ogre being taken for a walk, a man skiing behind a Lake Monster, a Mongolian Death Worm harassing a gardener, a Giant Centipede having a bath, and a Phoenix with fire extinguisher on standby. This is a very nicely presented book, and even has fictitious quotes on the back: ‘The Ultimate Guide For Any Aspiring Cryptid Owner’ – Werewolf Monthly, and ‘I Loved The Font’ – Sea Monster Preservation Society. Now comes the problem with this concept. It’s very much a contradiction. The vocabulary is plainly adult; when I say that I don’t mean blue, I’m talking about language which could not be comfortably read by young children. And yet the descriptions would only really appeal to youngsters of no older than primary school age. There seems to be confusion over to whom this book is targeted. There’s a veritable plethora of mythical animals on parade here: everything from the commonly known Werewolf, Zombie, Nessie, Ogre, Vampire; the lesser known Wendigo, Jersey Devil, Chupacabra, Queensland Tiger; and the generally unknown Emela-ntouka, Kongamato, Selma, Chemosit, and numerous others. So where is the background information? From where do they originate? Where are the examples of their appearances? There is nothing but a one-sentence description of the creature, which is followed by a load of dribble about whether you can take them out to walk or fit them in a dog basket. Please! I like a bit of fun as much as the next person, but this could have been properly informative as well as humorous. Instead, it misses on both counts. So, the bottom line is that I’m torn on this book, because it could have been so much more. It’s a wasted opportunity, reduced to something perhaps a parent can amuse a small child with for five minutes, before they lose interest and return to their iPad.